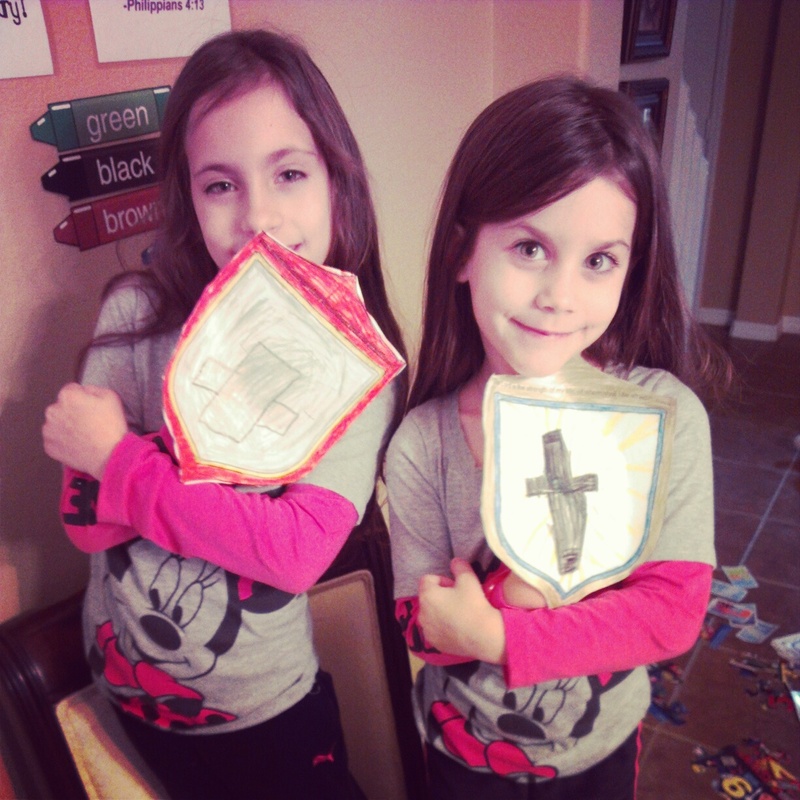 This week we are working on the Armor of God for the girls JBQ (Junior Bible Quizzing) questions. This afternoon we are talking about the Shield of Faith and Shoes that our worn on our feet, which brings the Gospel of Peace. What protects the Roman solider from arrows and blows from a sword? A Shield! The shield protected the Roman solider from the enemies weapons. Our spiritual enemies are constantly throwing arrows and thrusting swords towards us. The best way to deflect these blows is with the shield of faith. When we hold on to our shield, when we hold firm to our faith in Jesus, we can go forth boldly. I had the girls make paper balls. Then they took turns throwing them at each other. Of course they were hit with the balls because they were vulnerable, with nothing to protect themselves. Then I had them hold up their shields, nothing could get to them as long as their shield was in place! Imagine a fully armed soldier. He has his sword, his shield, his helmet, his breastplate and his belt…but his feet are completely bare. The picture probably seems strange, and it should! Just by thinking about it, we can tell something is missing. Without shoes the solider has to worry about where his is stepping or running and this is the last thing that should be on his mind in a battle! Fun Fact: The shoes of Roman soldiers were made of bronze or brass and included a part to cover the shins. The bottoms of the shoes were covered with spikes so they would help the soldier stand firm-or those sharp spikes could be used as weapons. What does Readiness mean? “Readiness” is “the state or quality of being ready; preparation; promptness; aptitude; willingness”. What does the gospel of peace have to do with shoes? God’s Church is sent to preach the good news, which will spread His way of peace around the whole world. By having our shoes on, we are ready to move! Remember each piece of God’s armor is important. Make sure to wear your armor everyday all day and the schemes of Satan will not prevail. 10 Finally, be strong in the Lord and in his mighty power. 11 Put on the full armor of God, so that you can take your stand against the devil’s schemes. 12 For our struggle is not against flesh and blood,but against the rulers, against the authorities, against the powers of this dark world and against the spiritual forces of evil in the heavenly realms. 13 Therefore put on the full armor of God, so that when the day of evil comes, you may be able to stand your ground, and after you have done everything, to stand. 14 Stand firm then, with the belt of truth buckled around your waist, with the breastplate of righteousness in place, 15 and with your feet fitted with the readiness that comes from the gospel of peace. 16 In addition to all this, take up the shield of faith, with which you can extinguish all the flaming arrows of the evil one. 17 Take the helmet of salvation and the sword of the Spirit, which is the word of God. This entry was posted in Craft, Homeschool, Inspirational and tagged armor, shield by fromthecommittedheart. Bookmark the permalink.